Now what? A tidal wave of victories by Republicans in the 2014 Midterm elections only matter if those in power will stop the radical transformation of the United States of America. Voters are overwhelmingly unhappy with the direction of the country. The Obama agenda must be thwarted; reckless spending must be stopped, the Constitution must be upheld, Planned Parenthood must be de-funded, families must be strengthened, marriage must be protected, ObamaCare must be repealed and replaced, Common Core must be eliminated, the borders must be secured and laws enforced. There is much work to do and to whom much is given, much will be required. A great responsibility comes with this historic victory. Republicans have been given marching orders from fed-up citizens demanding to be heard. Stop compromising and return to conservative principles! The country must be given back to the people who sent a clear message to both political parties: liberalism, Marxism, and socialism won’t cut it in America! The national debt is now over $17.9 trillion. Government must be reduced, cuts must be made, and taxes must be lowered to help struggling small businesses and middle-income Americans. The Obama administration must be held accountable and recent history proves the media sure won’t do it. Administration appointees, government agencies such as the IRS, and Leftist judges must be kept in check. Why have laws if lawlessness goes unpunished? The job outlook is not good and more people are relying on welfare than ever before in our history. There are more broken families, people are hurting, the spiritual state of the country is stagnant, and the church has become less effective in culture as morality declines. 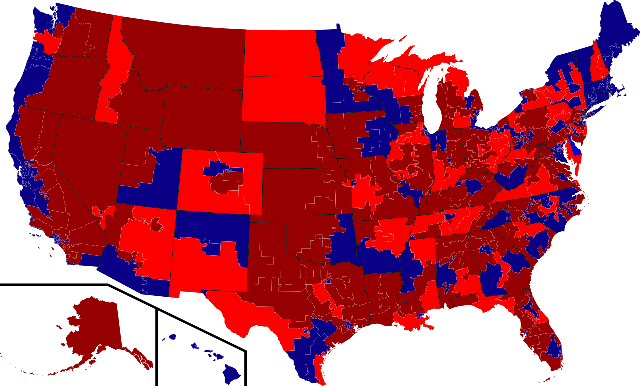 To be sure, there were some outstanding developments from the 2014 Midterms. The Republicans increased the number of seats in the House of Representatives by a net of 12, expanding their majority beyond 246, a record set in the 1946 election. They easily took control of the Senate while holding onto or winning a record number of Governor’s races in blue states like Massachusetts, Illinois, Michigan, Wisconsin, and Maryland. • Eighteen-year-old Saira Blair will become the youngest state lawmaker in West Virginia history. The pro-life, pro-gun Republican won a seat in the state House of Delegates to become the youngest state lawmaker in the U.S.
• Mia Love celebrated her surprise victory in Utah as the first black Republican woman to be elected to the House of Representatives. • South Carolina officially elected Senator Tim Scott, making him the first black candidate to win a statewide race since just after the Civil War. • Also elected to the Senate was Joni Ernst, the first woman elected who served in combat (Operation Iraqi Freedom in Kuwait) and is a lieutenant colonel in the Iowa Army National Guard. • In Texas, Will Hurd, a black Republican and former undercover CIA officer was elected to the House. • Former White House aide to George W. Bush, Elise Stefanik (30) is now the youngest woman ever elected to Congress, winning voters in a blue New York district. The Democrat’s fake war on women and attempts at playing the race card failed miserably. Enjoy this moment because it is time for action. We still need to encourage more Christians and religious citizens to vote or the 2016 Presidential election could be a big disappointment. The church could learn a lesson here. It appears conservatives worked to get their candidates elected across the country and the Republican ground game was much better organized which resulted in an annihilation of President Obama’s policies, many of which directly oppose the Bible’s teachings. Why is this so important? Politics affect every one of us! All these gains could amount to little if we the people don’t fight the foundational moral and spiritual battle upon which all else is based, and demand our representatives do the same. Some might argue “but you can’t legislate morality.” If that were the case, why do we even have laws then? The truth is someone’s morality gets legislated and is enforced every day in America. No government, no law, and no man is neutral. Individually and as a society we are either moving toward God or away from Him. We can sum up the battle in three words: God or man. Every law and regulation that is proposed and passed enforces one worldview or the other. It is impossible not to legislate morality. The Law is a moral teacher. The question is, which vision of law and morality will be enacted? America once enjoyed a limited government by the people for the people; a constitutional republic our parents and grandparents took for granted. You and I have done the same and we are less free today; government is more godless, culture is darker, sin is rampant, and Christians are less vocal outside of church. As the church goes, so goes America. When you vote for today’s Democrat party, you are supporting abortion, homosexuality, government expansion, Christ-less public education, and socialism for starters. Neither party is perfect, but a stark, glaring contrast exists in terms of biblical values. We desperately need change, but political change alone without a return to Christian principles might only last until the next election. This victory will not bring restoration and a much-needed revival to our land unless Christians repent and return to Jesus Christ, our only hope. Some good might be done short term, but God will not bless a nation whose leaders have turned their backs on Him. Our founders believed this and deep down, you and I know it as well.